It wasn’t long ago when the doors to institutional grade real estate opportunities were slammed shut to most investors. But the JOBS Act of 2012 was a game-changer that spawned a new era in real estate investing where investors could pool their funds together and gain access to previously unavailable real estate deals. Crowdfunded real estate investments made legal and accessible high potential real estate opportunities but they also attracted a wave of savvy entrepreneurs who founded high-fee private real estate investment trusts, or REITs. Before crowdfunded real estate investing became a buzzword and long before the JOBS Act got signed into law, a Chicago-based company, Origin Investments, had already been building a track record of investing success without gouging investors on fees. And now, thanks to the new regulations, if you are an accredited investor who wants exposure to the real estate sector with a top tier team who has a proven track record of success, you too can ride on the coattails of their future successes. Origin Investments provides investment opportunities that are geographically diversified, incur lower costs than many rival firms charge, and are managed by a team with a record of returns in the top 10% of fund managers. Origin Investments began without any of the fanfare usually associated with hyped-up real estate crowdfunding start-ups. When co-founders David Scherer and Michael Episcope launched Origin Investments, their ambitions were humble: to manage their own wealth and let friends and family participate in protecting and growing their wealth too. But when extraordinary risk-adjusted returns were generated word spread that Origin Investments was no ordinary real estate company. The first and second funds, Funds I and II, earned net IRRs of 28% and 20% respectively. From a handful of partner investors, Origin Investments has grown to now attract over 500 accredited investors. 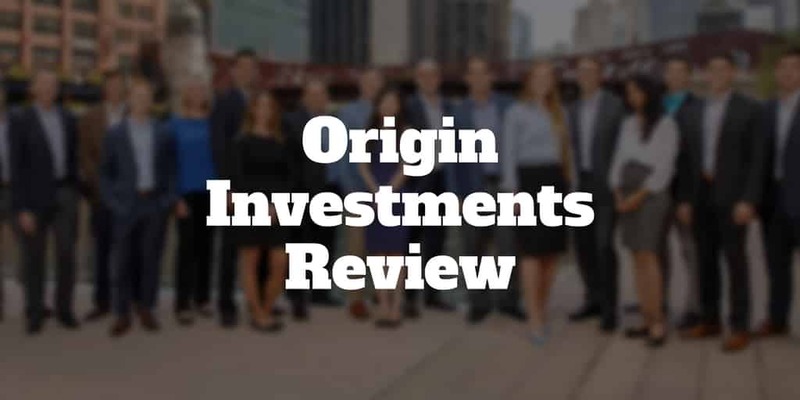 Unlike other crowdfunded real estate platforms that sprung up from the JOBS Act, Origin Investments earned its stripes long before regulatory changes made it possible to market private offerings to the public. While many rivals started out as technology platforms that excelled in marketing real estate investment opportunities, Origin began as a real estate company that subsequently added a technology overlay. Real estate investing is in its DNA, not an afterthought. But why should you invest your hard-earned savings with Origin Investments vs RealtyShares or Rich Uncles or Realty Mogul or Roofstock or Patch of Land, or any of the other online companies that make real estate investing more affordable and accessible. Like many of its competitors, Origin Investments acquires properties in high-growth markets, including Atlanta, Austin, Charlotte, Chicago, Dallas, Denver, Houston, and Raleigh. But where Origin Investments distinguishes itself from competitors is that its principals co-invest alongside partner investors. And they don’t invest trivial amounts either. In fact, the combined amount invested by principals stretches into 8-figures. What sets Origin Investments apart from most other competitors in the space is that other platforms are essentially a marketing expense whereas Origin controls deals from start to finish, scouting opportunities, conducting due diligence, and managing properties. Think of Origin Investments as a more traditional fund manager that has a vertically integrated investing process which cuts down on fees. In fact, the fees you pay are the same fees as those the principals and their friends and family pay. Investing alongside an experienced team with aligned incentives is good, but what else do you need to know before making a decision to invest with Origin? Origin Investments will verify that you are an accredited investor before providing you access to invest in opportunities that have maximum LTVs of 70%. When you sign up at Origin Investments, you have complete access to all historical information. If you want to see how the company forecast returns on previous investments, you can view that information and compare it to the returns earned by investors. You will need to verify that you are an accredited investor before you can invest in any of the funds. And while the early funds had high minimums of $500,000, the more recent funds have significantly lower threshold investment minimums of $100,000. Once you have been given the green light to invest, you can participate in real estate investments that are generally, but not always, split evenly between office space and multi-family units. The management team strives to purchase assets to which they can add value, thereby creating attractive returns to investors. This might sound obvious but the reality is many real estate investment companies look to manipulate returns through financial engineering. At Origin Investments, the maximum loan-to-value ratio is 70%, which compares well to many rivals, though Rich Uncles limits debt to just 50%. Generally, your assets will remain fully invested for a period of 6 → 7 years if the durations of previous funds are indicative of what to expect in the future. If you think for any reason that you may need the capital sooner, it is best not to invest because no secondary market exists to provide liquidity. Because the term lengths stretch over multiple years, you will need to be comfortable that Origin has factored in influences outside its control, such as Fed rate hikes. During our discussions with core team members, we were pleased to learn that Origin underwrites the Libor curve and builds models that factor in interest rate hikes on variable rate loans, so even a doubling of debt service over a 5 year period would not take them by surprise (but it would lower investor returns). Origin Investments spreads risk geographically across 8 regions and invests in multi-family and office space buildings that have yielded average net annualized returns of 24%. Fees are structured so that Origin earns a bonus when a minimum threshold return has been reached. Like all aspects of Origin Investments, we found its transparency when disclosing fees to be refreshing compared to some rivals who make it very difficult to discern total annual fees. Like many conventional fund managers, Origin Investments has a “2 and 20” fee structure which means that after a certain hurdle return has been met, Origin Investments earns 20% of the upside while investors receive the majority 80%. It is important to note that Origin Investments does not receive this 20% share until a minimum investor return of 9% has been reached. Other fees charged include an upfront equity fee of 1.5% of the invested amount and another 1.5% annual management fee. Compared to other real estate crowdfunding opportunities these fees are competitive and may even be considered a bargain in light of how well Origin has historically performed. Historical investment returns earned by Origin Investments have been nothing short of scintillating. 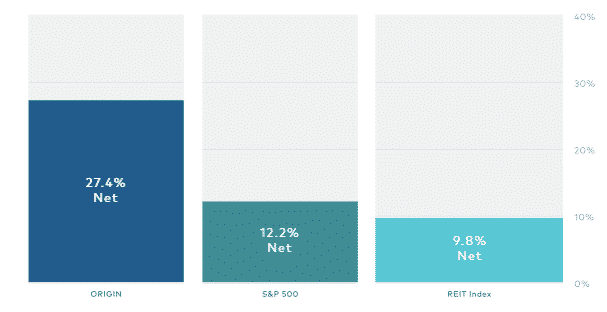 Before getting too carried away that future returns may rival past returns, keep in mind that the average net annualized returns of 24% were achieved in a low interest rate environment and Federal Reserve rate hikes may cast a shadow on future returns. As a prospective investor, you should pay close attention not only to the returns generated but also and, perhaps more importantly, the risk-adjusted returns. To understand the difference, think about placing a bet in a Vegas casino. If you feed the slots with coins and win a prize of $1,000,000 your return may be astronomical but what risk did you take to earn the reward? If you didn’t win, the loss would have been 100%. When you invest in real estate, you can’t afford to lose 100% so you need to limit risks where possible. As an investor, you want to know that the Sponsor, which is Origin Investments, has acquired a lot of transactional experience. With over $900 million in transactions conducted and superior investment returns generated, it is fair to say the Origin team knows the ins and outs of real estate investing so Sponsor risk is not a primary concern. Some properties are inherently more risky investments than others. If you invest in a hotel, the lease term is just one night for guests. Origin Investments chooses to invest in office and multi-family units where lease terms are significantly longer in order to build greater predictability of future revenue streams. You can think of market risk in terms of the old adage of property investing: location, location, location. If an investment is located in an area with good demographic trends and income levels, the likelihood is a deeper buyer pool exists when it comes time to sell. Origin factors market risk into its purchasing decisions by targeting high-growth regions. Origin Investments has historically generated superior returns, vets properties on your behalf, caters to multiple account types, and provides an online dashboard that is accessible 24/7. ✅ Low Fees: Compared to private real estate investment trusts, Origin Investments has a more competitive fee structure. ❌ Accredited Investors Only: You must have an income of $200,000 annually for the previous two consecutive years or a net worth over $1,000,000 excluding your primary residence in order to invest. ✅ Pre-Screened Investments: An expert team of professionals with combined transactional experience of nearly $1 billion vets property purchases. ❌ Illiquid Investments: No secondary market exists to liquidate your holdings if you need cash. ✅ Access to Institutional Grade Real Estate: Historically, it would have been almost impossible to access institutional grade real estate investment opportunities but Origin makes it possible to pool capital with other investors and get exposure to the real estate sector with much lower capital commitments than were formerly needed. ❌ Tax Considerations: Your tax filing costs may increase due to additional paperwork so it is best to consult with your tax advisor before committing capital. 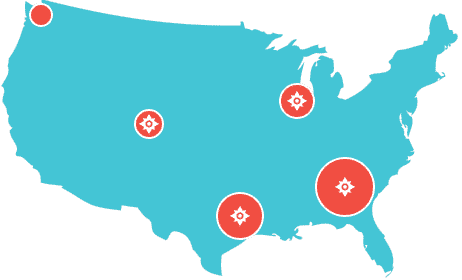 ✅ Diversified Real Estate Investments: Origin targets real estate opportunities in high growth regions, including Atlanta, Austin, Charlotte, Chicago, Dallas, Denver, Houston, and Raleigh. ✅ Taxable & Retirement Accounts: Whether you have an LLC, Trust, Taxable, or IRA account, you can invest on the Origin platform. ✅ Passive Return: You don’t need to roll up your sleeves and do the heavy lifting of scouting for your own investment opportunities nor managing properties, Origin does the hard work and provides you with the potential for a passive return. ✅ 24/7 Online Dashboard: The online dashboard provides full transparency into fees, investments, historical returns, and projections. Origin Investments stands apart from most real estate crowdfunding platforms. Not only has it delivered superior historical returns but it also charges lower fees than the average private real estate investment trust. From start to finish, Origin Investments manages the whole kit and kaboodle from scouting properties to purchasing and managing them, so you don’t have to roll up your sleeves and do the heavy lifting as might have been the case prior to the JOBS Act in 2012 when private real estate offerings could not be marketed to the public. With almost $1 billion in transactional experience behind them and a laser-focus on high-growth regions that provide diversified geographic exposure, the team at Origin has proven they know how to invest at scale and deliver for investors. They are much more like a conventional fund manager with a track record of success than a hyped-up Silicon Valley start-up with a fancy real estate technology platform that charges high fees. The bottom line is if you are an accredited investor willing to tie up your capital for a number of years, Origin Investments will give you exposure to the real estate sector from a team that has a proven history of success.